Our lawyers have put together a list of the most commonly asked questions about Slip, Trip and Fall claims. If you were injured in an Orange County slip and fall accident and have a question, browse through our site to find the answer, or simply contact us and we will provide you with a comprehensive answer. I was recently involved in a slip-and-fall accident in Orange County and sustained injuries. Can you help me determine whether or not I should file a claim? My daughter fell and broke her arm at a friend’s house in Newport Beach. How should I approach their family about paying for her emergency room bills and follow-up visits? I fell on an Orange County sidewalk and sustained a knee injury that required surgery. Can I seek compensation from the city for my medical bills? How can an Orange County injury lawyer help me after I’ve been injured in a slip and fall accident? What should I do after a California slip and fall accident? Can I sue for being injured by a falling tree or branch in California? How do I know whether I have a California slip and fall case? What if I didn’t take pictures of the scene where I fell in the grocery store? Do I still have a slip and fall claim? I Fell in a Store and Got Hurt. They Have to Pay for My Medical Bills, Right? The property owner created the condition that caused the fall. The property owner actually knew of the dangerous condition and did nothing to correct it. The property owner did not actually know of the dangerous condition, but should have known due to the length of time the condition existed. What if the Owner of the Property Has Nothing to Do with the Business? The same standards for responsibility apply to the possessor of the property as well as the owner. Thus, it will need to be factually determined by your Orange County slip and fall lawyer which party was negligent in not correcting the condition that caused the fall and consequent injuries. As the Injured Party, Do I Have Any Responsibility? Each person is charged with the duty to exercise a reasonable degree of caution. For example, if one slips and falls merely because he was inattentive and not looking where he was going, that cannot be attributed to the property owner or possessor. What if I Were Partly at Fault, But Not Completely? California law requires an apportionment of fault be determined. Therefore, if you were 50% at fault for the accident, you may recover only up to 50% of your damages from some other party or entity who was proven to be additionally at fault. 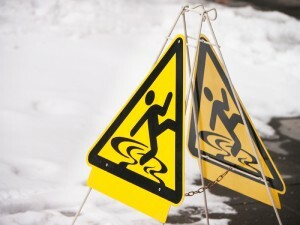 Injuries sustained in a slip and fall may be severe. Find out your rights. Call the experienced team at Russell & Lazarus: (800) 268-9228.